Aluminium bi-fold doors seamlessly connect your home with the outside world. These elegant sliding doors fold right back to inches of opening, enabling you to truly utilise the space you have available. Our experienced designers will build your aluminium bi-fold door with your Essex home in mind. Ensuring the colours and style you have chosen perfectly complement the existing aesthetics of your home. Their unique system allows you to extend your room right through to the outside, enhancing your living space and creating the ideal space for entertaining. Our aluminium bi-folding doors come in multiple configurations, giving you the choice to have your doors fold to the left or to the right. Modern double-glazed doors are sought after features in today’s homes. 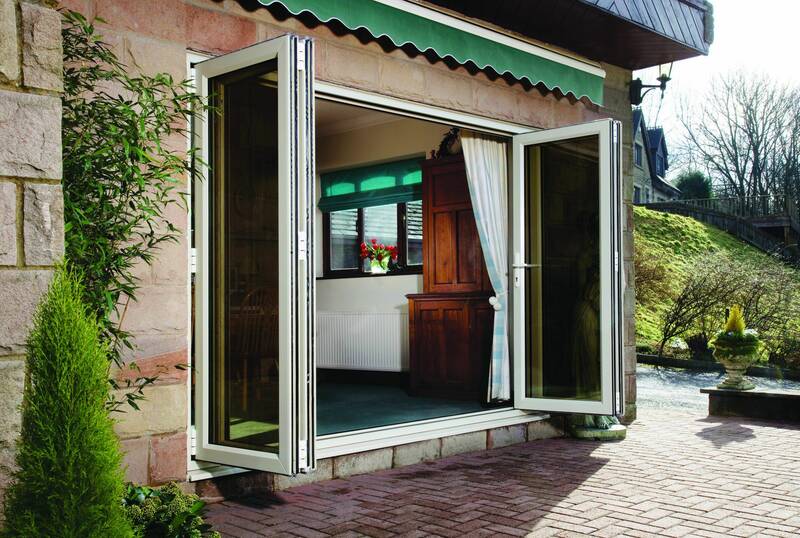 Our aluminium bi-folding doors will give your room that wow-factor, adding lots of depth, light and space. These doors look beautiful from both inside and out. Their slim and elegant frames provide less frame and more glass, opening your home to greater natural light. A bi-folding doors gives you the benefit of larger expanses of glass, giving you an unobstructed view when the door is shut. If you’re space is limited then these doors are a great option as they won’t require room to manoeuvre inside or out. Our bi-fold doors come in a wide range of colours and finishes, including wood-effects, textured finishes and metallic. Aluminium doors can be specified in virtually any colour, making it the perfect material for matching existing frames. Even better, powder coated aluminium is resistant to corrosion, discolouration, rotting and warping. Our aluminium bi-fold doors offer more glass than frame, with a super sleek profile which provides smooth sightlines for enhanced views and light. An effortless, smooth track system makes our bi-folding doors easy to open – ideal if you require constant access to your garden. They can be opened fully or partially due to a concertina design. It is this design which allows these doors to slide horizontally right back to opening. Brighten up your indoor space by opening an entire wall of your property. A bi-folding door will provide an expansive glass wall, letting in lots of sunlight. Aluminium is incredibly strong and durable. Due to this inherent strength, it can hold more glazing with a slim frame. Its versatility also means that it can be moulded into virtually any shape or size which is perfect for a bespoke specification. Our aluminium bi-fold doors are built using the highest grade of aluminium, thermally focused glass and multipoint stainless steel locking system. For our security focused customers, our aluminium bi-fold doors are the ideal choice. Made from structurally reinforced aluminium, ensuring they retain their inherent strength year after year regardless of weather conditions. We also fit intelligent, stainless steel multi point locking systems our aluminium bi-fold doors. Maximising the security and reliability for your complete peace of mind. We provide a bi-folding door installation service in Great Dunmow and surrounding areas. We do offer our supply and fit service outside of these areas, depending on the requirements of the job. Please get in touch with one of our team members today to see if we offer our services outside of these areas, depending on the nature of the work. Providing an exceptionally high level of customer service is as important to us as the performance of our aluminium bi-fold doors. We have invested in leading software that allows our customers to generate free online quotes for aluminium bi-fold doors. Simply visit the online quote section of our website, design your ideal sliding door and click go. If you would rather discuss your aluminium bi-fold door with one of our team members, get in touch via our contact form or call us on 01371 821917.